Richard "Rich" Hamburg, MPA, is the Executive Director at the Safe States Alliance and is located in Washington D.C. Rich joined Safe States in 2018, and previously he served as Executive Vice President and Chief Operating Officer at Trust for America’s Health (TFAH) where he oversaw public policy initiatives, advocacy campaigns, and internal operations. Prior to TFAH, he served as the American Heart Association’s national Director of Government Relations. A native New Yorker, Rich is a graduate of the State University of New York at Albany, from which he received a Bachelor of Arts in Political Science and a Master of Public Administration. Rich is responsible for providing direction and leadership to advance the mission, strategic plan and annual operating plans. He oversees and serves as an advocate for the field of injury and violence prevention professionals’ interests with federal agencies and other partners and stakeholders. Sharon Gilmartin, MPH, is the Deputy Director at the Safe States Alliance and is located in Greensboro, North Carolina. 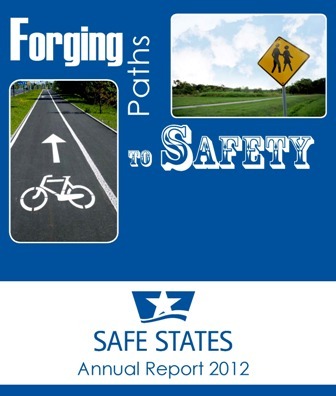 Sharon joined Safe States in 2014 bringing a background in public health injury prevention, with an emphasis in motor vehicle injury prevention. She earned her undergraduate degree from the University of North Carolina-Chapel Hill, and her Master of Public Health in Social and Behavioral Sciences from the University of Washington in Seattle. In her free time, Sharon likes hiking, baking, working with rescue dogs, and spending time with her husband and daughter. Sharon is responsible for all Safe States Alliance’s programs, membership, and overall organizational activities. Paul Bonta, MA, is the Director of Government Relations for the Safe States Alliance and is located in Breckenridge, Colorado. Prior to joining Safe States in 2015, Paul spent 12 years as the chief lobbyist at the American College of Preventive Medicine aimed at expanding the nation’s preventive medicine physician workforce and four years each at the American College of Cardiology and American Academy of Dermatology where he worked to advance issues of interest to the house of medicine. Paul earned his Bachelor of Arts from St. Mary’s College of Maryland and his master’s degree from Catholic University. He moved from Washington, DC to Colorado to enjoy all the outdoor winter and summer activities such as, skiing, mountain biking, backpacking and kite surfing. Paul leads the Policy Fellow Program, provides guidance and support to expand injury and violence prevention programs in Congress, the Administration and relevant federal agencies. Jamila Porter, DrPH, MPH, is the Director of Programs and Evaluation at the Safe States Alliance and is located in Atlanta, Georgia. She joined Safe States in 2007. With over a decade of experience in evaluation and injury and violence prevention practice, Jamila manages a variety of Safe States program, policy, and evaluation initiatives. She also provides evaluation-focused technical assistance and training to practitioners at local, state, and national levels. Prior to joining the Safe States Alliance, she worked in health care consulting and international development. Jamila earned her Bachelor’s degree in Communication and Health Policy and Administration from Wake Forest University, her Master of Public Health degree from Mercer University School of Medicine, and her Doctor of Public Health degree from The University of Georgia College of Public Health. In her free time, she enjoys theater and traveling abroad. Jamila manages the association’s program, policy, and evaluation initiatives. She leads the CDC Core SVIPP Evaluation project, supports a U.S. Coast Guard-funded boat passenger injury surveillance project, serves on the youth violence prevention-focused STRYVE Action Council, and provides staff support to the Safe States Policy Committee. Michelle Wynn, MPH, is the Director of Finance and Operations at the Safe States Alliance and is located in Atlanta, Georgia. Michelle Joined Safe States in 2006 following her work as an epidemiologist at the Cancer Division at the Centers for Disease Control and Prevention; the Agency for Toxic Substances and Disease Registry; and local health departments in Columbus, OH and metro Atlanta. She has Master of Public Health degree in Epidemiology from the Rollins School of Public Health at Emory University and a Bachelor of Science in Biology from Emory and Henry College. Michelle is an avid University of Tennessee football fan and enjoys spending time with her husband and son. Michelle is responsible for membership invoicing, organizational financial and operational administration, and grant reporting. Michelle provides staff support to the Finance and Audit Committee. Julie Alonso is the Program and Communications Manager at the Safe States Alliance and is located in Olympia, Washington. Prior to joining Safe States in 2015, Julie served as the Child Injury Prevention Specialist for the Washington State Department of Health and state designee for Safe Kids Washington. Julie has over fifteen years’ experience working in public health and substance abuse prevention. She brings extensive experience leading coalitions, conducting strategic planning, and communications. Julie earned her Bachelor of Arts from the University of Maryland University College. When not at work, she can be found with a camera in her hand and hiking boots on her feet. Julie loves to travel to new places, spend time outdoors and support her family. Julie manages strategic communications, facilitates the STRYVE Action Council, and provides technical support to the CDC funded Regional Network Coordinating Organizations (RNCOs) and National Peer Learning Teams (NPLTs), as well Core SVIPP states. She provides staff support to the Hospital Injury Prevention Special Interest Group (HIP SIG). Eva Bland, MA, serves as a Program Coordinator at the Safe States Alliance and is located in Durham, North Carolina. As a Program Coordinator, Eva is responsible for managing key projects and membership activities. Before joining Safe States in 2018, Eva worked as the communications specialist for the University of North Carolina (UNC) Injury Prevention Research Center where she helped develop trainings that translated scientific findings around injury and violence prevention. Eva received her bachelor’s degree in marketing from Appalachian State University and her Master of Arts in Technology and Communication with the UNC School of Media and Journalism, where she focused her research on developing an online hub to address the opioid crisis in North Carolina. On the days Eva does is not working at Safe States, she seeks comfort in being outside – hiking, biking and swimming with her dog Roscoe. Eva provides support to the Annual Meeting Planning Committee and oversees the overall coordination of the Safe States Annual Meeting, as well as the State Technical Assessment Team (STAT) program. Ina I. Robinson, MPH, is a Program Manager at the Safe States Alliance and is located in Atlanta, Georgia. Ina joined Safe States in 2013 and has over fifteen years of public health-related experience. Ina’s background is in behavioral science research methods, injury and violence prevention, public health program development and management, data analysis, federal government budget and performance measurement processes, and program evaluation methods. Ina earned her Bachelor of Arts in Sociology from Hampton University and her Master of Public Health degree with a concentration in Behavioral and Community Health Sciences from the University of Pittsburgh. In her spare time, Ina enjoys serving her church community, singing, baking, and traveling with her husband. Ina manages a NHTSA-project to Engage Public Health Leadership to Address Driver Behavior Change, manages several evaluation and technical assistance activities for the CDC Core SVIPP Evaluation project, and supports the State Designated Representative Special Interest Group (SDR SIG). Christa Thelen, MA, CHES, is a Program Coordinator at the Safe States Alliance and is located in Denver, Colorado. Prior to joining Safe States in 2018, Christa conducted health education at the local public health level along with community health and injury prevention in hospital settings/systems. Christa received a Bachelor of Arts in Exercise and Health Science from Alma College and her Master of Arts in Health Promotion and Program Management from Central Michigan University. She has also received a certification in Child Passenger Safety (1998) and is a Certified Health Education Specialist (2017). Christa loves dogs – she owns a Cockapoo (6yo) and a mini Bernadoodle (1yo) – and would own more if her family allowed it. Christa supports workforce development efforts, including oversight of the Safe States Training Center, Continuing Education efforts and coordinating trainings. She provides staff support to the Membership Development Committee.